Today got off to a nerve-racking 5:30AM start and hour drive to Children’s Hospital. As mentioned before, we went into today’s operation not knowing if it would be cast change or cast removal. Not only that, but after our stressful experience last time, we just had no idea what to expect. We weren’t exactly expecting that we’d get to touch Londyn’s chubby little thighs again today, but the possibility still gave us hope. The nurse who checked us in was very helpful and attentive to our needs. 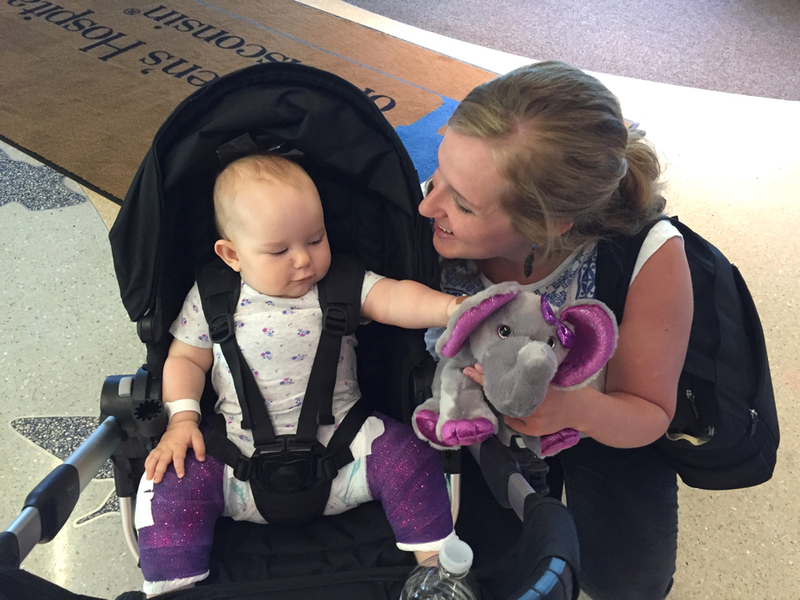 I described our last operation and the issues Londyn encountered with her airway. The nurse made a special note that it was very important to us Bridget be given the opportunity to nurse Londyn as soon as she woke from anesthesia. This may seem like a small thing, but it was refused last time by a certain anesthesiologist, and was quite maddening. The anesthesiology team arrived and listened to our concerns regarding the use of full intubation and the whole negative previous experience. They listened to our story, and decided to use the LMA, a less-invasive airway option, which had worked great for Londyn’s first arthrogram. Seeing these medical professionals actually listen to us and respond like that was huge, and set the tone for this operation. One thing about my daughter, if you have not realized it by now, she is beautiful. Like, abnormally cute. I wish I took photos of all the reactions the hospital staff had to her. She also happens to be the sweetest and most content spica casted creature on the planet. As a result, today she got the special treatment. Our nurse brought us a stick with all the cast color samples to choose from. We decided on purple again, but with one addition. 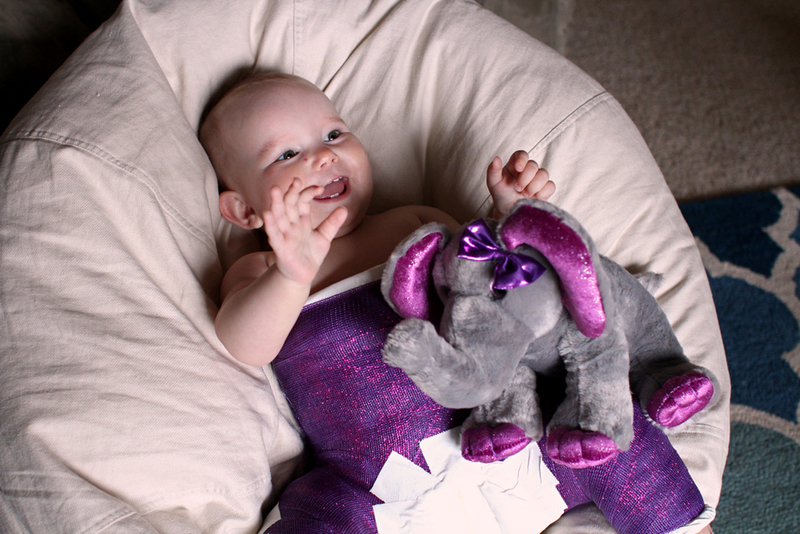 Bridget had heard from a nurse last time that sometimes they do casts with sparkles in them, and when our ortho came in, she asked if he could do it. He began a long explanation about how they COULD do it, but the glitter was down in the clinic and they don’t usually do it and… eventually he stopped and said, “let me make a call.” Ten minutes later he was back in our room with a tub of purple glitter to add to her cast! Again this may seem like a small thing, but the rest of the staff were acting as though he had done something so out of the ordinary that Londyn must be royalty! For the third time, we watched them take our baby away again. Just over an hour later the doctor was back. Londyn had been re-casted. In purple. With glitter. The arthrogram showed significant progress, but still not enough for him to feel comfortable taking the cast off. Things are clearly improving and the treatment is working, but slowly. Six more weeks then, and we will reevaluate treatment options. Eighteen weeks total and the cast will come off, for sure. The post op items went surprisingly fast, with no complications for Londyn, and we were returning home before we knew it. On our way to post op, and later walking out of the hospital, everyone (really everyone) commented on the most beautiful cast they had ever seen. My mom was kind enough to fly out for Londyn’s operation. She stayed and played Ninja Turtles with Grayson while we were at the hospital. It’s so neat to see how much the kids enjoyed her being here, and we all can’t wait to see her again. It was comforting to have a definite end in sight from the doctor. Comforting, but also kind of not. The cast will definitely come off six weeks from now, and the best part is that it will be done in clinic, meaning no anesthesia (although now we will have to prepare Londyn for the terrifyingly loud cast saw!) We will finally redefine “normal” back to something it used to look like. Londyn will finally be able to pick up where she left off developmentally, barely rolling from back to belly and sitting up on her own. But the “what if’s” of how her hips will respond in the next six weeks and beyond loom overhead. The questions of next treatment steps if the spica cast does not work are questions we are ignoring for now. Here’s what I know: my daughter continues to defy logic with her toothy smile and attitude. She is an inspiration to see and know. I love her, and she is going to be the tiny royal princess in her sparkly spica cast at her first birthday party next month. I can’t wait.